2005 Jeep Wrangler Unlimited LJ with ONLY 65,000 all original miles. This Jeep is in excellent condition inside and out, it has been fully serviced and drives NEW. Frame is in excellent condition, no excuses. You will not find another one like it, please look at all the pictures to see how nice this Jeepis. This Jeep includes: 4.0L SMPI I6 "POWER TECH" ENGINE (STD) Straight 6 Cylinder Engine Gasoline Fuel PREMIUM AUDIO GROUP CD Player AM/FM Stereo CD Changer 4-SPEED AUTOMATIC TRANSMISSION 4-Speed A/T A/T EASY-FOLDING SOFT TOP (STD) Convertible Soft Top 24E UNLIMITED CUSTOMER PREFERRED ORDER SELECTION PKG 4-Speed A/T A/T Straight 6 Cylinder Engine Gasoline Fuel PREM CLOTH HIGH-BACK FRONT BUCKET SEATS Cloth Seats Bucket Seats FRONT FLOOR MATS Floor Mats *Note - For third party subscriptions or services, please contact the dealer for more information. * CARFAX BuyBack Guarantee is reassurance that any major issues with this vehicle will show on CARFAX report. 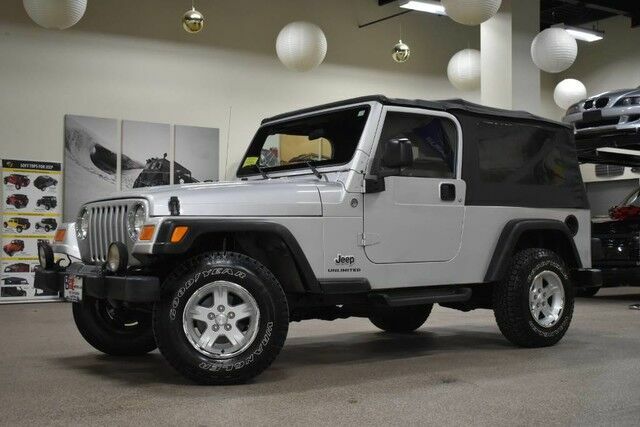 On almost any road condition, this Jeep Wrangler Unlimited offers solid performance, reliability, and comfort.